When you plan to buy a new house, you always imagine a big and well maintained lawn surrounded by landscape borders in the front of the property.A home buyer imagines the lawn to be surrounded by exquisitely colored flowers and landscape borders. So if you have recently purchased a property in the Maple Valley, WA area,but its lawn is not beautifully decorated,nor is it surrounded by landscape borders,then do not worry as help is only a phone call away. 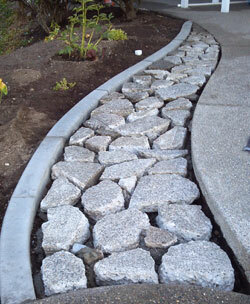 Our landscape edging and concrete curbing services in Maple Valley are durable, affordable and highly functional. Our concrete curbing and landscape edging services are designed according to the instructions of our Maple Valley clients. This means that the landscape borders and concrete curbing services are modified to meet the needs of new home owners in Maple Valley. Maple Valley commercial and residential property owners will be amazed at our concrete curbing and landscape edging services, which are time-efficient and carefully crafted. We understand that the needs of no two people are the same; therefore we offer personalized landscape borders, concrete curbing and landscape edging services for our Maple Valley customers. Why Choose Us for Your Maple Valley Lawn Edging and Landscape Borders? So, if you want your Maple Valley yard to look well maintained and have landscape borders around it,hire our landscape edging and concrete curbing experts. Get in touch with our landscape edging experts serving the Maple Valley area and get to know more about our concrete curbing services. Maple Valley area residents can call the landscape edging experts at Curbzilla at 253-777-1221 for professional services.